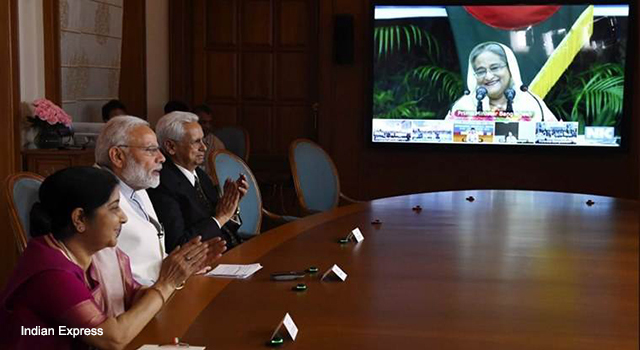 Bangladesh Prime Minister Sheikh Hasina and India Prime Minister Narendra Modi, in a video conference, jointly inaugurated the (i) construction of the India-Bangladesh Friendship Pipeline Project, and (ii) the third and fourth dual-gauge rail lines in the Dhaka-Tongi section and dual-gauge rail line in the Tongi-Joydebpur section of Bangladesh Railway. E-plaques were unveiled on this occasion on 18 September 2018. The 130-kilometer India-Bangladesh Friendship Pipeline Project will support pumping of oil from India to Bangladesh, connecting Siliguri in West Bengal, India, and Parbatipur, Dinajpur, Bangladesh. The Rs 346 crore (around $47.6 million) project has an annual capacity of 1 million tonnes. Prime Minister Modi remarked that the pipeline will help fulfill Bangladesh’s energy needs at less costly rates. This pipeline is expected to be completed in 30 months. The Dhaka-Tongi-Joydebpur Railway project will boost connectivity between the two countries, and generate higher revenues for the railway sector. It supports the strengthening of Bangaldesh’s national and urban transport. Speaking on the occasion, Prime Minister Modi hailed cooperation between India and Bangladesh as an example for the world, calling them "neighbors, geographically" and "family, emotionally."